In late 1980 UK novelty song ‘Video Killed the Radio Star’ charted well in pacific countries. It was also the first song ever to be played on America’s MTV (Music TV), sparking much debate about the future of radio. As the records kept playing, music video never did kill radio (or its stars); both were happy to live alongside each other. In 1985, Dire Straits allowed MTV to decide the direction for their classic ‘Money for Nothing’ music video… There was worry that MTV would kill rock music… Of course, it didn’t, and it still hadn’t killed radio. What really killed radio, especially local radio, was the utter greed of broadcasting network companies that used 1990s satellite networking technology to maximize profits. Today, people tell me that ‘New Zealand is just too small to support local radio’. But in the years before bluetooth internet music really took off (circa 2014), this statement would have been rubbish. Local radio had survived very well from the 1940s until the middle 1990s… I get tired of common Kiwi excuses like, ‘our market is just too small’ and ‘we are so isolated here at the bottom of the world, so things are more expensive’… In reality people in NZ usually get screwed by the country’s quiet but powerful upper class and elite. For decades Kiwi’s have accepted a much lower salary and often, an inferior range of over-priced household goods compared to nearby Australia. Greedy retail business owners, company/factory shareholders and goods importers are to blame for most of this. Likewise the greed of broadcasting network companies are to blame for killing local radio. It was never about ‘population’ or ‘audience reach’ and everything about company shareholders wanting to bleed as much profit as possible by networking almost all programming from major cities. Since the mid 1990s, the – still current – network shareholders of NZ commercial radio have had a total disregard toward the historical norm that holding a broadcasting license involves an obligation to provide a service to the local community. For decades, radio wasn’t just ‘music’, it was also about healthy localism: community connection, understanding, and reporting or reflection of local events. The people behind the microphone – announcers and executives – had an overarching desire to serve and bind the community… Traditional ‘radio people’ were also not afraid to push for local government transparency, believing that political representatives should be made accountable. Therefore, radio had a very important role in many aspects of local life. Now, networked radio is only about using music to attract listeners to hear advertising. In essence, each individual NZ shareholder of these networks have betrayed their local community (and hence, the people of the nation) by turning a blind eye to what the destruction of local radio stations really meant. This is probably because these shareholders are mostly professional investors; all their life values are based around financial profit. They are totally ignorant about what community connection means, how important it is, and how radio was once a major part of it. Sadly, the scaling back of local radio started as early as 1985, making it hard to convince a new generation of listeners (albeit a minority media market compared to the past) how important local radio was, and should still be. 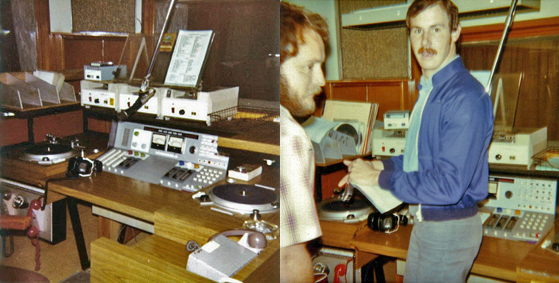 When I briefly returned to Hawke’s Bay, as a 15 year old in January 1985, the first thing I did was to visit Bay City Radio, 2ZC, 1278am. As in 1978, the programme director was only too happy to show a teenager through the studios, although he gently mocked my new way of speaking from three years of living in Brisbane… As Frankie Goes to Hollywood’s hit ‘The Power of Love’ played through the station’s corridors, I was sad to learn that much of Bay City’s good equipment (from a huge 1981 upgrade) had been shipped to stations in nearby larger cities… So it seems that even when the government had an involvement in local radio, Bay City was being downsized. But of course, things got really bad after privatization and networking. In about 1999, when some NZ and Australian radio network board executives finally woke up to the simple fact that killing local radio was no good for profit, it was almost too late. They had lost much of their local audiences right across the nation by networking almost everything for at least three years. At the same time, nearly everyone on foot and in shops were playing music from mp3 devices. Rather than panicking and quickly re-introducing local radio, these same executives denied reality (to appease shareholders) by denouncing mp3 as a big fad, like the 1979-89 cassette walkman. They wanted to believe that when the ‘mp3 player craze’ ended, people would come back to radio. But mp3 was an entirely different animal to the Walkman: people could easily acquire huge amounts of hifidelity music without paying a cent, meaning that they listened to these devices for many hours a day. With almost no local content, the networks unintentionally conditioned or groomed a new generation of listeners into thinking that radio was primarily about music – with frequent childish gabble from announcers – followed by annoying commercial advertising. Not surprisingly when broadband and later bluetooth came along, people got their music fix my other methods, and radio became even more of a dinosaur medium. Now, no matter how much the networks try to win listeners back by having ‘less talk’ and scheduling only four ad breaks an hour, they will never have the same audience numbers as in the 1980s, when people were more faithful to a local radio station because, among other things, it made them feel connected. Today, listeners have the simple choice of listening to FM/AM music with slightly less gabble/less ads, or online streamed music with zero gabble and almost no ads. They don’t have any choice about listening to something local, as it doesn’t exist anymore. Today ‘local radio’, an enormous misnomer, is not much more than music sent (networked) from hundreds of kilometers away, with local ads thrown in by remote control. You get local ads, not local radio. The networks regularly highlight that they have ‘local’ content in the form of a breakfast or weekend sport show. But this is nothing compared to 24 hour local radio, where announcers could talk to people about events at local places, and dedicate songs to locals celebrating weddings, births, birthdays, anniversaries, and even mourning deaths. Apart from a poorly produced local breakfast show, nowadays, people don’t hear local community service announcements anymore, nor do they hear local opinion, and they don’t even get any local weather… On Friday afternoon the networked announcer in Auckland, trying to sound ‘local’ ambiguously said, ‘It’s gonna be mostly cold and cloudy everywhere over the weekend’… In fact, the next day in Napier was clear and beautiful. Networking certainly did kill radio, including the ‘radio star’, a person who had developed a personality and corresponding performance primarily by much identification with a local audience, and – more widely – a local community. As the shareholders of these new broadcasting networks believed that ‘radio is mostly about selling advertising by playing music and we can do that by networking everything’, they fired hundreds of experienced and professional announcers. They then employed a few dozen young – and lowly paid – ‘network announcers’ to act as an occasional interruption to music, doing nothing but song-naming and time-calls. The networks put little kids on radio. Granted, most of these kids really love their jobs, but these new kids on the block have been greatly burdened by the fact that, being networked, they cannot ‘connect’ with listeners. Connection means being local, and vise versa. Today’s networked kid announcers have never been able to connect – and therefore – learn to identity with a specific local community. In fact, paradoxically, they are actually told to ‘sound local’ by not mentioning anything that is region specific, as they play music in a far away major city studio. But unfortunately, most of these announcers also lack basic training or experience. On 20 July 1969, man apparently walked on the moon, and to celebrate this anniversary the young morning announcer on The Breeze played the ‘one small step’ audio clip from NASA. He then followed up by saying ‘Oh imagine what it would have been like to be around back then’… This was clearly the most stupid thing I’d heard on radio in a long time… If I had said that on any Australian station, the programme director would have killed me. The key demographic for The Breeze are people in the 30-50 age bracket. But the station clearly has an important fringe demographic of people over 50 – and these people definitely do not need to ‘imagine being alive’ when man did the moonwalk. In professional radio jargon, The Breeze had instantly broken intimacy and alienated a huge portion of its audience. There are also problems with the music programming at a number of NZ networks; again The Breeze is a prime example… While the network station draws upon a wide range of music covering four decades, there are still many problems with their playlist… In the past two weeks they’ve played ‘Radio Gaga’ at least six times during nights, enough to make listeners think that their music director has some type of fascination with Queen… The station is also too fond of Boy George’s ‘Karma Chameleon’, and almost anything by Michael Jackson. At the same time, there are many fine artists that are really absent, such as Peter Gabriel, Dido, Lenny Kravitz, Bic Runga, Robert Palmer, Lenka (etc)… As far as I know, none of these guys/girls are gay, but that shouldn’t stop The Breeze from playing more of their music. To be fair (and not to appear homophobic), The Breeze should also be playing a lot more of the extremely talented (and gay) Darren Hayes, especially his Savage Garden years… Interestingly, while The Breeze plays a lot of old campy Wham, they could play more of George Michael’s solo repertoire (heads up young Breeze employees: George was the lead singer of Wham, he was openly gay, so you can put his stuff on a higher rotation), especially the beautiful but solemn ‘Waiting for that Day’ from his 1990 album ‘Listen Without Prejudice’… This is a good point: it does seem that the ‘person’ or ‘people’ at The Breeze do listen and schedule music with much prejudice… Oh, and on the subject of ‘Radio Gaga’, why doesn’t The Breeze play some more Lady Gaga? For starters, she took her name from the Queen song (many gay points there), but even better, she is a big supporter of the gay community in the states (huge selector points = The Breeze will now put all her stuff on high rotation). The Breeze, as well as other NZ networks, can’t seem to get it right, despite their frequent promo that claims, ‘nobody spends more time working on the playlist than The Breeze’. Much of radio today is intolerable… Announcers are childish, playlists prejudiced, and even their commercial advertising is ridiculously insulting. The stations do not seem to be able to employ writers and producers who have the skills to create anything interesting. Again, this is probably due to the low salaries being offered. First, there are the forever annoying ads that use cliches that should have been killed off 30 years ago – like ‘drastically reduced’ and ‘massive sale’. Then, I am totally turned off by their frequent repulsive ‘blokey’ gang singing ads for trades like mechanical and carpeting services… They think that sounding very uneducated and uncouth is so cool (tuneless group singing: ‘we are the boys from Macs Repair, we gonna fix your car – in the air’). In fact, nowadays your average mechanic is more likely to be akin to a well educated, well paid, and well uniformed computer engineer. This single example (I could give others) shows that the people who currently ‘create’ NZ radio ads possess extremely old-fashioned stereotypes, or are just plain stupid. Probably both. Worst of all, are the ads read by local business owners (especially Real Estate agents)… In fact, in any other country, radio follows a very old golden rule: never allow advertising clients to write or record their own ads. But being only focused on money, I know that most NZ radio networks allow clients to do both. Consequently, they will let any egocentric drongo on-air – to monotonously read his company ad, no matter how appalling the script and voice may be. Is it any wonder that most of the population now regard radio as an old novelty technology that people – who can’t stand silence – use as emergency background sound when the internet is broken. 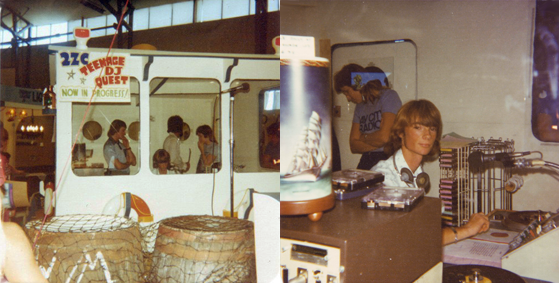 Bay City Radio was heavily involved in the local community and went as far as to build a very good ‘outside broadcasting hut’ for the 1981 National Scout Jamboree, a temporary dwelling that became their home for a lot longer, after fire broke out back at the Napier studios. In fact, the station was regionally famous for its various outside broadcast units that it created for special events. Among other qualities, such as real on-air personalities and creative ads, Bay City had a commitment, a presence, and was the media representative for the voices of people from Hawke’s Bay. It’s all gone now, and if you think that an empty studio in Napier, that plays ads when Auckland presses a button is ‘local radio’, you are either a network shareholder, very young, or one of the few people who have never really listened to radio. So Glen Clifford, former radio announcer and currently, customer service English trainer based in Asia – now owns some of Bay City’s best 1980s singles. At least by acquiring these records, some local radio can live on in my memory and imagination during Saturday evening get togethers… You’re all invited! All the singles have broadcast information and Bay City Radio/2ZC stickers stuck, stamped and written all over their sleeves, so it’s not hard to get the radio party/lounge feeling happening… At a technical level, all the records were only ever played on high grade broadcast turntables… Their quality is therefore much better than if they had been owned by regular folk, played on cheap equipment, and unsuitably stored. In fact, the records are still up to broadcast quality for AM radio. Perhaps the most incredible and delightful thing from this enormously nostalgic journey, is the finding of ‘Hot Child in the City’, the same record I heard when I toured Bay City Radio studios back in October 1978 – when I was nine years old – almost 40 years ago. (Note, local volunteer amateur community radio, with its patchwork of minority ‘special interest group’ shows cannot be compared to radio for the ‘local’ masses…). label, an August 1973 reissue of the 1964 classic. New Zealand Ltd, from Master Recordings of RCA’. record companies also killed vinyl singles!